UN Day will be celebrated at UNIS Hanoi on Friday November 30 and we are busy with our preparations! The traditional assembly on the Friday morning will be the culminating event of our Discovery-Grade 12 SDG Week when all our students will take part in projects supporting the UN’s Agenda 2030 and towards achieving the Sustainable Development Goals. The Assembly will open with our traditional Parade of Nations to celebrate the 195 Members States and Observer States of the United Nations. Next week we will be sending out invitations to students to participate in the Parade of Nations and we want to take this opportunity to share with you the process we follow to send out these invitations. The following process has been developed with the goal of ensuring the most equitable process for all students to have an opportunity to carry their nation’s flag during the UN Day School Assembly. The flags from the 68 member states represented in our community in 2018-2019 will be paraded downstairs in the Sports Centre carried by students from those countries. 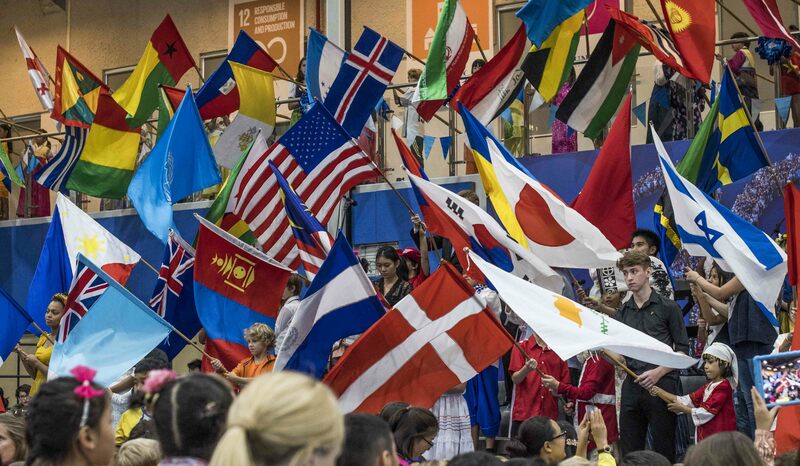 The 127 other flags will be upstairs in the balcony parade and can be carried by students from any nation. If the only student from a country is in Grade D-K2, they may carry their flag assisted by an appointed MSHS student chaperone. Students in Grades 1-11 may not be selected to carry their nation’s flag downstairs for two consecutive years in any national group with more than two students represented. They can still be selected to represent a member state in the balcony parade. In recognition of our graduating class’s final year, we will invite the oldest of our G12 students to carry the flag of their nationality. There are 23 nationalities represented in this year’s graduating class. In the case that there are only students from a country in one division, two students will be selected from that division. Please note for Elementary School one flag bearer would be selected from G1-3 and one from G4-5 in order for the older student to support the younger flag bearer. Students performing in the UNIS Hanoi Symphonic Orchestra may not carry a flag. We determine a student’s nationality based on the country/ies of citizenship (passport/s) registered in the UNIS Hanoi school information system. Individual affinity, heritage, family history or past place of residence is not taken into consideration. All invitations will be issued by lottery (random selection based on individual Veracross Student ID) within national groups. The goal is to provide every eligible student with equal opportunity. If any student invited does not want to carry their country’s flag, the replacement bearer is then drawn by lottery from the national group in their division. Flag bearers do not have the option to transfer their invitation to a family member or friend. The 127 flags from the other UN member states will be carried by students selected by lottery from G4-G11 (one bearer per flag). Again, replacements will also be selected by lottery from this group. The initial invitation is sent to parent 1 email, CC parent 2 email and student email (for students from G4 and above) with clear instructions to confirm before the deadline of Monday October 22 at 18:00. If we do not receive a response to advancement@unishanoi.org before the deadline the invitation will be re-assigned to another student. A reminder will be sent before the deadline on Friday October 19. Confirmation will be sent from UNIS Hanoi when we receive a response to accept or refuse the invitation by parent or student and cc’d to the original recipients. A second round of ‘lottery’ generated invitations will go out on Tuesday October 23 with a deadline of Monday October 29 at 18.00. There will be no reminder for second round invitations. If following two rounds of invitations, there are flags which do not have bearers, student council/senate will be engaged in the process.